Anthony McCall is an artist known for his use of film projectors and lighting to create pieces based on time, space and human interaction, this including his popular artwork Line Describing a Cone (Griffin 2012). A re-enactment of McCall’s artwork through the Expanded Cinema series, initiated by Louise Curham and Dr. Lucas Ihlein will inform the analysis of the artist’s ongoing piece of work. This avant-garde work is a component of McCall’s ongoing practice with light as an interactive tool which is developed throughout the artists ‘solid light film’ series. The idea for McCall’s piece was conceived whilst on a journey from England to the United States in 1973. The question “What would a film be if it was only a film?” being the article of conjure for the piece (Michaud 2011, p. 3). The progression of the artists own life and journey serves as a comparison for the progress visible in the artwork and its eventual completion (Michaud 2011, p. 3). The Expanded Cinema re-enactment of McCall’s work is motivated by making the piece available once again for human experience. Works such as Line Describing a Cone that exist for a period of time do not lend themselves to documentation or archiving easily, therefore the re-creation of the piece allows for a first-hand experience for continuing audiences (Curham & Ihlein 2015). The ongoing practice of presentation for Curham and Ihlein allows Line Describing a Cone to take physical form beyond its initial exhibition in the 1970’s. The constrictions of the works physical form have been reduced as the artists, with permission from McCall and aid from the Sydney Moving Image Coalition and the London Filmmakers’ Co-op have created a present, interactive viewing experience. Whilst also encompassing ageing media forms and themes in line with McCall’s original ideas and intentions (Michaud 2011, p.3). Anthony McCall’s Line Describing a Cone is a 30 minute presentation involving a beam of light coming form an animated film. The beam of light created by the projector slowly arches over the time period adding to the circumference of the circle. Depending on the position of the viewer as time progresses, a convex or concave shape will eventuate creating a 3D object. A smoke machine is also incorporated to highlight the beam of light, giving the artwork a sense of tangibility and encouraging human interaction. Interaction from viewers is essential as their contact with the piece changes the course and structure of the design (Griffin 2012). The size of the installation is also determinant of the level of interaction, with audience’s positions and sizes effecting the dimensions and frequency of light alteration. McCall estimates the artworks base should be between eight and eleven feet with the length being between thirty to 60 feet, McCall also stating in 2004 “The proportions of this projection vary, but the scale is large” (cited in Griffin 2012). The artwork is projected on 16mm film and is meant to be displayed in a closed off exhibition space where contact is encouraged and audiences aren’t separated from the piece in any fashion. Finally the space is completely dark in order to highlight the beam, remove ambient distractions and immerse the viewer. Curham and Ihlein’s realisation of McCall’s work is true to the intentions of the artist’s original design. The method and presentation all remain consistent with the only continually differentiating aspects being the space it is presented and the audiences interaction with Line Describing a Cone. The light projected in the exhibition serves as the focal point for the audience. The slowly progressing circle serving as the film takes a backseat to the interactive elements its method creates, although is no less important in terms of expressing the ideas of McCall. The circle formed over the thirty minutes gives light to the projects conception, reflecting the aforementioned trip the artist made and its eventual completion. The projection also challenged ideas of what was considered conventional cinema. Concepts of time and space are tested in a period in which art practices were constricted. McCall developed his practice as a shift towards new communication methods affected by the information age began to arise (Lee 2004). The mobile nature of the piece required a newer delivery, resulting in a thirty minute exhibition in which the key ideas relate to the audiences immersion rather than the passive nature of other works in that time. McCall explains saying ‘The film exists only in the present: the moment of projection. It refers to nothing beyond this real time … the space is real, not referential; the time is real, not referential.’ (cited in Griffin 2012). It’s also important to recognise the ethical components associated with its interaction. This being an exhibition space means there are multiple participants over its display. Users question their own experience as well as other peoples as their interactions with the beam of light effects other participant’s level of effect and involvement. Somebody positioned closer to the projector who is touching the light is interacting with McCall’s piece as intended, although without this intention in mind participants effect the experience of those positioned closer to the projection. Viewers are encouraged to move around the installation and therefore will be the cause of or receiver of this effect, making participants question their interaction as well as how they affect others. Keeping in mind the style of art during the time and the experimental nature of McCall’s work the visual narrative created not only by the projection but by the audience is an extension of the materiality involved in the piece and added to the foundation of experimental art that was to follow (Michaud 2011, p. 7). Anthony McCall’s Line Describing a Cone was the beginning of a series of practices that developed the artist’s work with light installations. McCall’s solid light films explore the relationship between the work and the viewer and continues this experimentation with his other projects. Other works including Long Film For Four Projectors (1974) and Meeting You Halfway II (2009) speak to the artists fascination with light as an engaging media. Despite the time between installations, and the computer created aesthetic of his more recent pieces, the works are consistent in their themes whilst discovering new relationships between the audience and the artwork (Sonntag 2012). In terms of the context of the era during the pieces conception, the minimalistic avant-garde approach taken by McCall was beginning to frequent more in artists practices. It was a time of uncertainty for art where the diversity of pieces added to the viewing experience. Artists experimented with new ways of expression, discarding the modern architecture in order to evoke new meaning beyond the conceived notion of standard art practice (Lee 2004, p. 60). McCall does this by not only encouraging active interaction with the piece but by questioning the time and space of art at the time. For example audience members were invited to view the work at specific times in a distraction free environment so that they could immerse themselves in the piece for the full thirty minutes. This challenges the passive nature of art viewership existing at the time as well as continuing to present day by which the viewer has control over their experience. The political context of the time is also important to note as activism and the power of the individual act emerge, testing the notions of coordinated collectivism and ideologies seen in in 1960’s (Lee 2004, p. 61). Experimental art spoke to this contradiction with the avant-garde being a means of protest for those concerned with the shifting climate but also as breaking down the barriers surrounding traditional art practice. It is also important to recognise the work in its re-enactment context. Curham and Ihlein recreate the piece and its audience’s perspective can be effected by a contemporary context to that of the 1970’s. Technology has become the current major influence on art practice, even effecting the methods of McCall’s later work in which digitally created lights are used in Meeting You Halfway II (Eye 2009) rather than Lines projection method. Although in their re-enactment of McCall’s work Curham and Ihlein stay true to the projection method of the time in order to recreate the particular visual narrative of the works original. The decision to ignore the use of current digital technology, which would be much simpler, is in order to recreate this aesthetic. The projection method was important to McCall’s practice and therefore in recreating this they state that “the work of our aesthetic precursors is essential for understanding, and building upon the work of the past” (Curham and Ihlein 2015). So in order to recreate as well as reimagine the experience in a modern mind frame the components of the piece were kept consistent. In conclusion McCall’s installation is an artwork that challenged ways of thinking in terms of art exhibition and practice. The visual narrative coupled with ideas of audience interaction aim to immerse the viewers and make them question their own surroundings as well as the conceived surroundings of others. Line Describing a Cone was the beginning of McCall’s experimentation with light and thanks to re-enactments created by Curham and Ihlein allow current audiences to participate in a first-hand experience rather than a passive interaction which originally the piece challenged. Therefore the experimental artwork comments on the context of art in the present day as well as the notions regarding art and its capabilities in the 1970’s. Jones, A 2009, A Companion to Contemporary Art since 1945, Blackwell Publishing, Carlton, Vic. McCall, A 2003, ’Line Describing a Cone and Related Films’, The MIT Press, vol. 103, pp. 42-62. 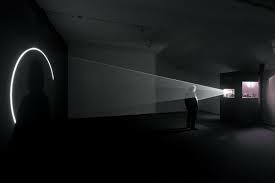 Michaud, PA 2011, ‘Line Light: The Geometric Cinema of Anthony McCall’, The MIT Press, No. 137, pp. 3-22.
just chiming in here. Your reflections are very interesting! – I just have one correction. Teaching and Learning Cinema “presents” or “enacts” Line Describing a Cone (we don’t “re-enact” it). The 16mm film print is readily available from LUX in London, and we hire it from them for our public and educational screenings. We simply follow McCall’s instructions to set the work up (size of the room, use of hazer machine, getting the smoke alarms turned off, making the room as dark as possible, using a xenon arc lamp projector, creation of an event with an invited audience, and so on). 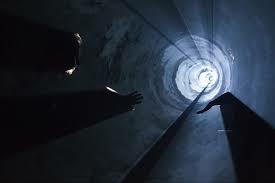 If all these conditions are met, the work ‘comes alive’ – but it is still Anthony McCall’s Line Describing a Cone (the “original”) – not a re-enactment of it. This might be a minor point but I think it’s worth making! 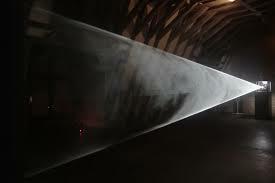 The key factor is that Anthony McCall himself does not need to be physically present for his work to manifest itself. This is in contrast with our other projects, such as “(Wo)man with Mirror” and “Horror Film 1 Re-enactment”, which have required us to make changes to the original in order to be able to present it without the originating artist being present. These are more correctly “re-enactments”. They have a duality: we argue that they simultaneously offer an experience of “the original work” (they have its DNA) and at the same time, they are mediated reflections on the original work. These re-enactments are also doubled in terms of their authorship – they belong to both the originating artists and the re-enactors. who we invite to visit us from time to time – and we are so fond of this fellow that we organise an event to introduce him to our local friends. Everyone enjoys the introduction, which in turn makes us look good. Thanks for your comments Lucas especially for the correction. I hope that my writings didn’t come across as ignorant to the process and practice your enactment significantly displays. I thoroughly enjoyed the artwork and am thankful for the opportunity to view the manifestation of such an excellent work. The ability to interact with Line Describing a Cone greatly informed my capacity to write about the artwork. Therefore I see the importance and authorship that comes with creating such a piece. The tangible experience created by Teaching and learning Cinema offered insight into McCall’s themes. Whilst also displaying individual thoughts on audience interaction that come with any realisation of the piece. This entry was posted on April 26, 2015 by Ramblings Of A Drunken Sailor in Uncategorized.